Volcanoes and Sunspots | Watts Up With That? …. Nine of the 11 events occurred during the solar inactive phase (sunspot numbers < 40), despite the fact that exactly half of the 306 years during the period of interest fell in the solar inactive phase …. Now that sounds very impressive, nine out of eleven eruptions came at an inactive solar phase, it must be a real phenomenon … or not. The problem with this claim is the tiny number of data points, only eleven of them. In fact, nine events out of eleven is within the 95% confidence interval for a fifty/fifty coin flip. This means that despite sounding quite large, his finding is not statistically significant at all. In any case, since these kinds of claims are made quite often, I thought I’d take a look at the question of whether sunspots affect eruptions. Doesn’t make sense to me, but lots of folks seem to believe it. I started by looking at the biggest eruptions, those with a volcanic explosive index (VEI) equal to five or greater. We’ve had nineteen of them since 1750. It turns out that no less than thirteen out of the nineteen occurred when the monthly sunspot number was quite low, below 40 sunspots … sounds impressive, right? But a closer examination shows that the result isn’t all that impressive. Figure 1 shows the analysis of the VEI 5 and greater volcanoes compared to the sunspots. Figure 1. 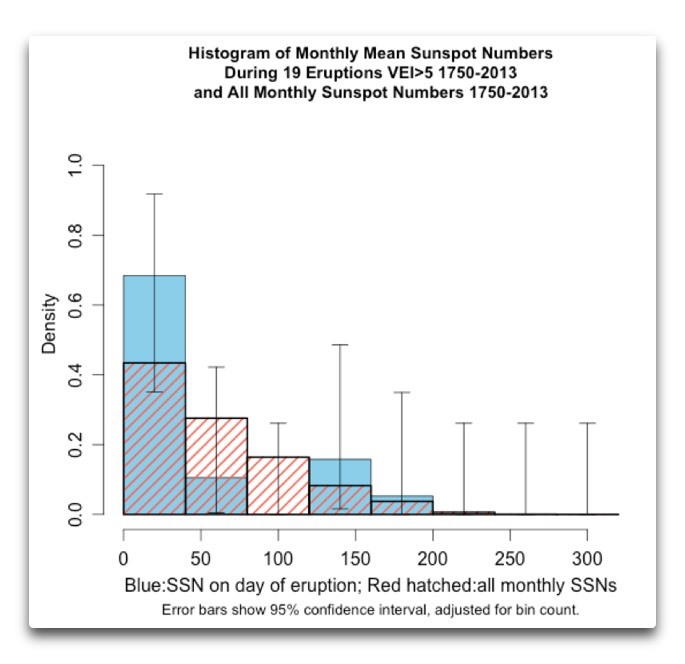 A comparison of the histogram of the monthly sunspot levels during the 19 largest eruptions since 1750, compared to the histogram of all of the monthly sunspot levels since 1750. The vertical axis shows the fraction of the total number of trials in each bin. As you can see, this result suffers from the same problem as the “Nine of the 11″ claim above—the dataset is so small that you end up with very wide error bars. As a result, despite the fact that thirteen of the nineteen eruptions are in the range of 0-40 sunspots, and none of the results are in the range of 80-120 sunspots, neither of those outcomes is statistically significant. So obviously, our sample size is too small to tell us much of anything. Let’s look at the next step down, those with a VEI of four or more. Figure 2. 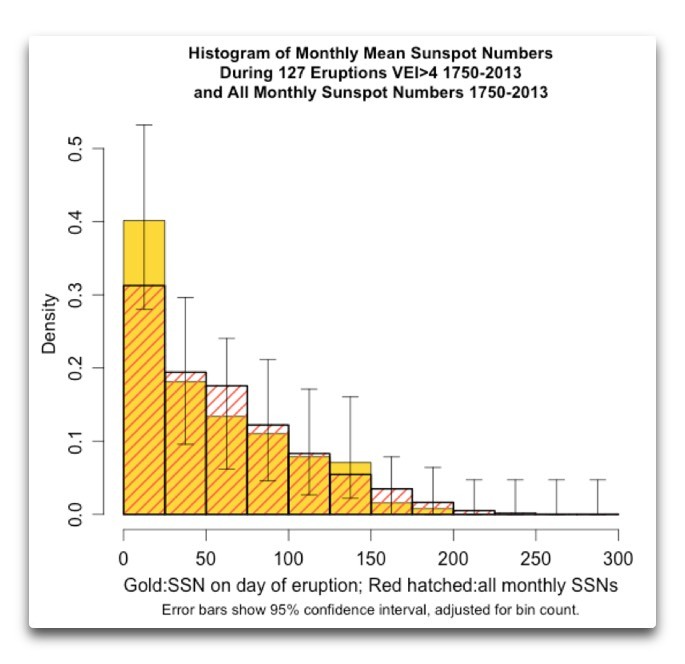 A comparison of the histogram of the monthly sunspot levels during the 127 largest eruptions since 1750, compared to the histogram of all of the monthly sunspot levels since 1750. The vertical axis shows the fraction of the total number of trials in each bin. Again, we see the same problem. While there are bins with more samples and bins with less samples, in no case are the results statistically significant. Well, how about a bigger sample yet? Figure 3 shows the eruptions with a VEI of three or more. Figure 3. 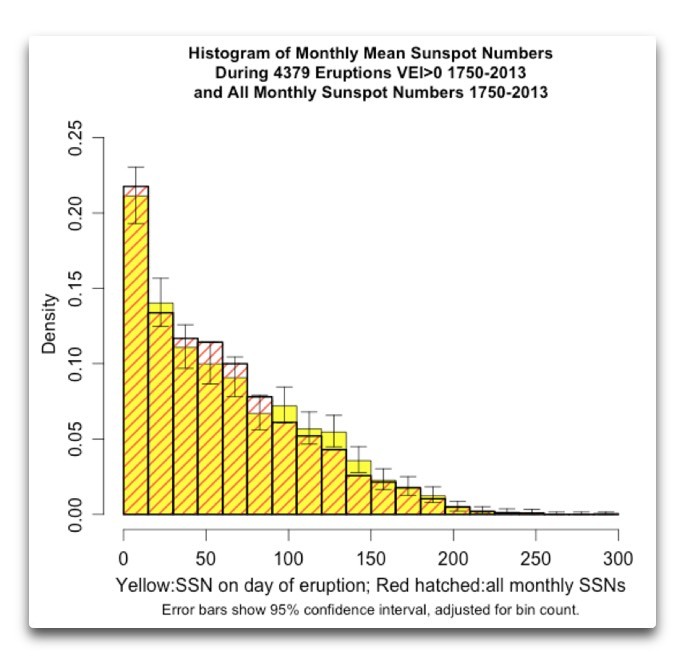 A comparison of the histogram of the monthly sunspot levels during the 636 largest eruptions since 1750, and the histogram of all of the monthly sunspot levels since 1750. The vertical axis shows the fraction of the total number of trials in each bin. Well, it’s not looking any better. Still none of the bins show a statistically significant result. So at this point, lets look at every single volcano in the dataset. Figure 4. A comparison of the histogram of the monthly sunspot levels during all 4,379 eruptions since 1750 in the dataset, and the histogram of all of the monthly sunspot levels since 1750. The vertical axis shows the fraction of the total number of trials in each bin. OK, finally we have a couple of bins that are barely statistically significant, the ranges 120-135 sunspots, and 135-150 sunspots. Figure 5. Graph of earlier eruption dates with each vertical line showing the date of one volcano. Figure 6. Graph of modern eruption dates with each vertical line showing the date of one volcano. As you can see, nature is naturally “clumpy”, with periods of more volcanoes and less volcanoes. Now I can think of several non-sunspot reasons for this clumping, including shifts in the tectonic plates, or sparse reporting, or repeated eruptions by a single volcano. The problem arising from the clumped nature of eruptions is that the number of sunspots generally doesn’t change much month to month. 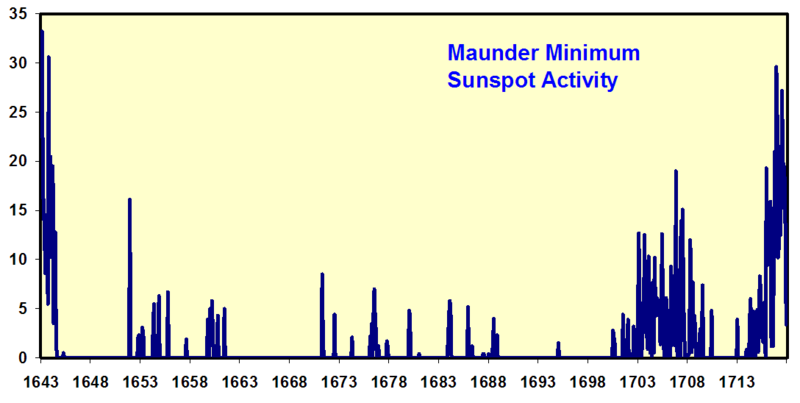 The average monthly change in sunspot numbers is only about 13 sunspots. And this means that when we have a “clump” of volcanoes from whatever cause, say one volcano erupting five different times in six months, it will lead to a distortion of the sunspot record because it will incorrectly increase the numbers in that particular bin or bins. Now, it’s unclear exactly how to adjust for this oddity. I could do it by increasing the size of the error bars using a Monte Carlo analysis … but I’d need to somehow replicate the exact nature of the “clumpiness” of the underlying data for my pseudo-random proxy data. And I haven’t yet figured out how to do that. Figure 7. Histogram of the month of the occurrence of all recorded volcanoes since 1750. Counts have been adjusted to allow for the different lengths of the months. There is one month (January) with a slight excess of eruptions. I ascribe this to the naturally clumped nature of volcanoes, although you are free to believe otherwise. AND OF COURSE … if you disagree with someone, please have the courtesy to QUOTE THEIR EXACT WORDS so that we can all understand the exact nature of your objections. so it’s not full story either. Maybe both the gravitational and solar influences need to be considered. Erroneous refutation is just as easy as erroneous attribution. Don’t jump to conclusions. It could be the Saros Cycle (6585 days) or the Metonic Cycle (235 synodic months). The ocean currents East of Africa change with a frequency matching the Saros cycle and there is a sine wave cyclical change in rainfall in the summer rainfall region of Southern Africa. The change in ocean currents causes regional changes in sea level as described by Bob Tisdale’s discussion of SL in the W Pacific. Perhaps that is a trigger or suppressor of latent quakes/eruptions. It seems to me that ‘not finding’ something looking at eruptions v.s. month (etc) doesn’t mean there isn’t a cycle there. Maybe after a heck of a lot more data has been collected for a few centuries we will be able to understand what the pre-conditions are which can be triggered by these cyclical changes in stress and strain. I still find it interesting to hunt! I think we should be looking at Earth rotation with respect to Volcanoes and Earthquakes as (1) one of the parameters that might affect them. If we look at length of day changes as in the image below, we might see the solar cycle decline. NO NO NO, yes you just might see a decline in solar cycle. In particular; Figure 3. Leap seconds per year between 1972 and 2010 (courtesy of W. Dick8, 2011) on page 4 and you might see how sparse the addition of leap seconds have been since 1997. The next article may provide more clues to the Earthquake, Volcano enigma…………. (Phys.org) —We all know that the Earth rotates beneath our feet, but new research from ANU has revealed that the center of the Earth is out of sync with the rest of the planet, frequently speeding up and slowing down. Associate Professor Hrvoje Tkalcic from the ANU College of Physical and Mathematical Sciences and his team used earthquake doublets to measure the rotation speed of Earth’s inner core over the last 50 years. They discovered that not only did the inner core rotate at a different rate to the mantle – the layer between the core and the crust that makes up most of the planet’s interior – but its rotation speed was variable. “This is the first experimental evidence that the inner core has rotated at a variety of different speeds,” Associate Professor Tkalcic said. “We found that, compared with the mantle, the inner core was rotating more quickly in the 1970s and 1990s, but slowed down in the 80s. The most dramatic acceleration has possibly occurred in the last few years, although further tests are needed to confirm that observation. Scientists have so far assumed the rotation rate of the inner core to be constant because they lacked adequate mathematical methods for interpreting the data, says Associate Professor Tkalcic. A new method applied to earthquake doublets – pairs of almost identical earthquakes that can occur a couple of weeks to 30 or 40 years apart – has provided the solution. “It’s stunning to see that even 10, 20 or 30 years apart, these earthquakes look so similar. But each pair differs very slightly, and that difference corresponds to the inner core. We have been able to use that small difference to reconstruct a history of how the inner core has rotated over the last 50 years,” he said. Associate Professor Tkalcic says this new method could help us understand the role of the inner core in creating the magnetic field that allowed life to evolve on Earth by acting as a shield from cosmic radiation. “What we have developed is a very powerful way to understand the internal structure and dynamics of our planet,” he said. What about eruptions compared to distance from Sun? This is one that at least seems possible. Distance from the sun moves almost in lockstep with the calendar year, with a precession time of thousands of years to make one cycle. For the time span in question, from 1750 on, the shift has only been tiny. It’s nearest in early January and furthest in early July. As a result, the monthly frequencies above should show the pattern high in Jan and low in July. Is that cycle there? Maybe. Unfortunately, the noise is large. However, I think I can look another way, because I have the data to calculate the distance to the sun directly. Give me some time. Which was Tolstoy’s point, that the six months of increasing distance from the sun is favorable for seafloor volcano activity. OK, I looked at the solar distance versus both earthquakes and eruptions. Zip. Nada. Nothing. Random. And upon reflection, this makes sense. Despite being in orbit, the earth is in gravitational freefall. Thus when we go nearer and farther from the sun, the amount of solar energy changes. And the tides change, but I already looked at that in my previous post. What doesn’t change in the slightest is that other than tidal forces, the effect of the gravity of the sun doesn’t change. This is because we are in free-fall around the sun, and as a result there is no effect from the variations in the gravitational force between the sun and the earth. How about when nearest distance of sun AND when perigean spring tide? 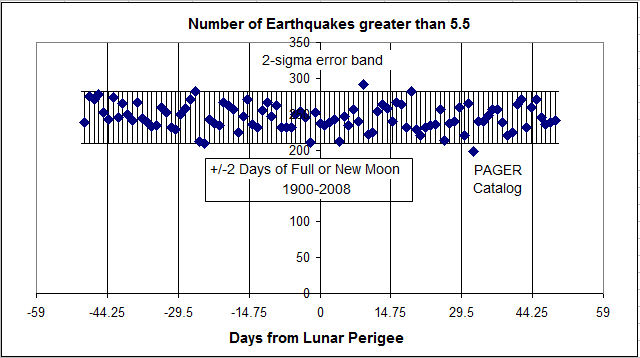 So don’t include perigean spring tide when moon is full, just when it’s new. In relation to the person who is proposing this link between sun spots and volcanic activity, what is their hypothesis. By what means can sun spots induce volcanic activity? Or “by what means does volcanic activity induce fewer sunspots”? Simple meaningless correlations can go either way. Let me answer your question in the way I understand this particular issue. And if anyone see some thing wrong or not proper, please do help and correct me. To get at the point of actually have some clarification, have to start from the “why” , why this claim. These kind of claims come always from the ones that are convinced or have very much “faith” in the what known as “the sun is doing it”. They fail to understand that any time there is some evidence or scientific hypothesis about some strong correlation of any thing with the climate change they have to try and connect the Sun effect to it. For example the volcanic activity and seismic activity lately has been considered as with a considerable correlation and a probability to have a significant part in climate and climate change…..therefor if shown that Sun does do that, than the sun is doing it. Totally regardless that in the long run the Sun itself has quasi no correlation at all with climate change,,,,,, and while very clear evidence shows the contrary of what claimed…….climate does not even care about Sun variations, but never the less these guys keep trying stubbornly.. The undeniable and indisputable correlations, the clearer and stronger ones with climate change are, the greenhouse effect (CO2 emissions), the global ice variation, the global sea level variation and then to a degree the volcanic activity may to a degree be seen as a correlation to be considered especially when very easy can be connected with the above correlations. So the answer to your question has to be seen in the context of the desperate attempt to connect the Sun to climate change through volcanic activity, as per it’s own merit the Sun fails to show for any significant effect. While some can not give up on the Sun some others can not give up with M.cycles and the 100K years glacial periods. And in circles we keep going. Again, anyone who finds error or fault with my understanding in this particular point…..please do not hesitate to correct me. Salvatore comes to mind: -), if I am not mistaken. I’m curious why you include a co2 correlation when we have two decades of non correlation? I believe GHG do have an effect, but with co2 being less than 5 percent of such gases, and water vapor being 95% of the total we do no one a favor by playing IPCC games of disregarding ,by omission, the role of water vapor. First correlation does not mean causation. Second, 2 decades make not for climate change, especially when trying to dismiss the undeniable correlation of CO2 emissions to climate change. So undeniable that the main “fight” is over which follows what, the CO2 or the temperatures. Then again have to remind you about the CS, a considered metric of climate change due to that undeniable correlation. Unless you proposing to ignore any thing in climatology and “burn” anything known thus far about climate change and paleoclimate, then you have to accept this much. It is the Abc of climatology, either we like it or not. The obvious culprit would be solar magnetic fluctuations. Such fluctuations could conceivably transfer some kinetic energy via interaction with the planetary magnetic field. Just what kind of time lag there would be between the energy uptake (from a magnetic interaction), which would be transferred initially to the liquid outer core, and when that might manifest in seismic activity is impossible to even estimate. Even if you could estimate when the effects would “surface,” if there were such beasts, the effect would be miniscule compared with the inherent internal activity of the planet. 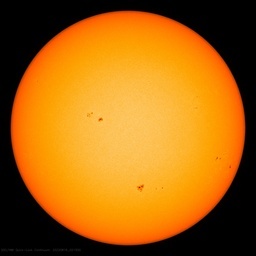 Sunspots may even be a sign of a inner activity of the sun. As far as I know, the sun’s magnetic Field pulses with the 11-year cycle of the sunspots. The same is with the sun flares and the solar wind. Solar wind is affecting cosmic rays, which are affecting cloud formation. A lot of possibilities to speculate. And if you look at David Evan’s Notch-delay-Theory, then forces with a delay of 10-14 years following the intensity of the sunspot numbers are reaching the earth. Not the sunspot per se but its regulation of cosmic rays that maters i think…. The cosmic ray effect mightaffect cloud formation and thus weather. It would not affect vulcanism. What of this supposition of coronal hole streams effecting tectonic movement? Is this possible due to gravitational or magnetic forces? The strength and polarity of coronal hole streams absolutely correlate with increased seismic activity. It turns out that no less than thirteen out of the nineteen occurred when the monthly sunspot number was quite low, below 40 sunspots ..
than 100 versus days with sunspot values greater than 100. Use the red-hatched bars on Willis’s graphs above. That’s the sunspot frequency. It’s roughly 40% of the time if I’m eyeballing that right. The lack of basic statistical knowledge amongst these so called scientists leaves me flabbergast. You don’t even have to be paricularly well educated to know that something occurring 9 out of 11 times could just be random. I could put the threshold higher and find something occurred 11 out of 11 times. Not to be facetious, but here’s an example: Wow–all 12 calendar months have less than 33 days! ALL! It’s that silly. 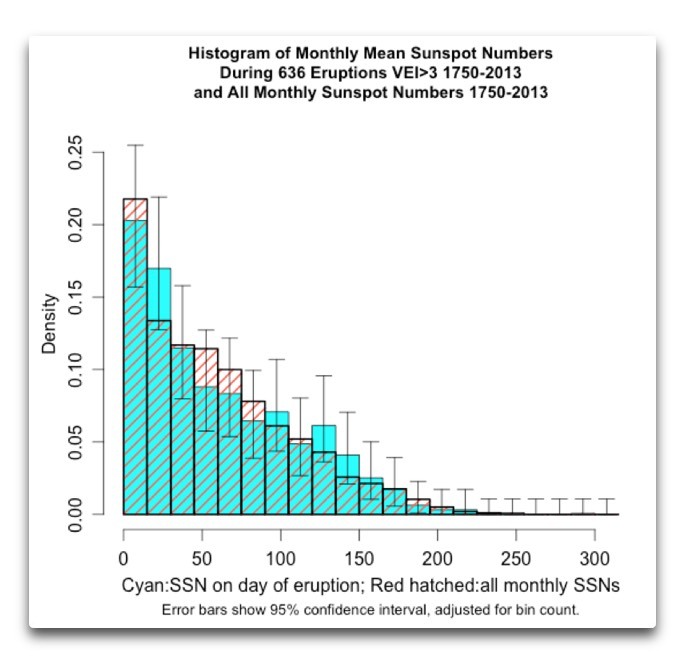 There is a distinct lack of eruptions around 1800 (Dalton Minimum), the lowest SSN count since Maunder, invalidating the hypothesis. An integral ( suggest 22 yr) might correlate closer to the global temperature anomaly rise, or even show that there is a positive (rather than negative correlation as claimed) with sunspot number. I found something on those lines but only on a limited number of (regional) eruptions. 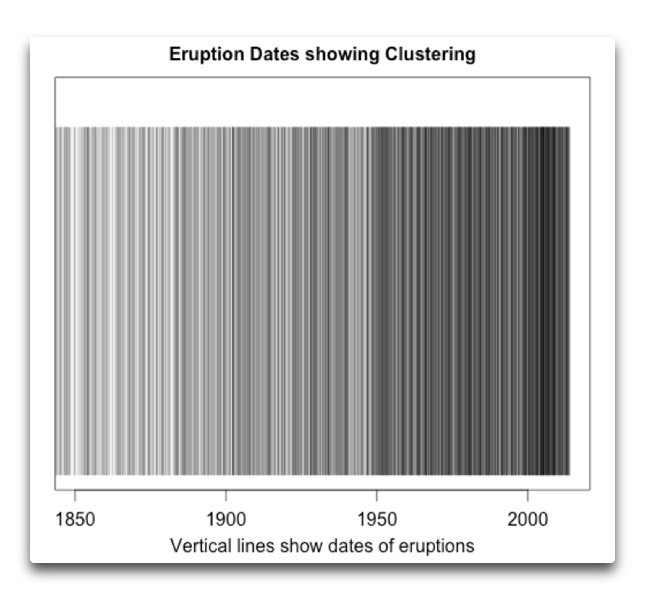 Figure 5 shows eruptions clustered in time. Suppose there were no clustering. For illustration, suppose one year between eruptions. That would give us predictive ability. 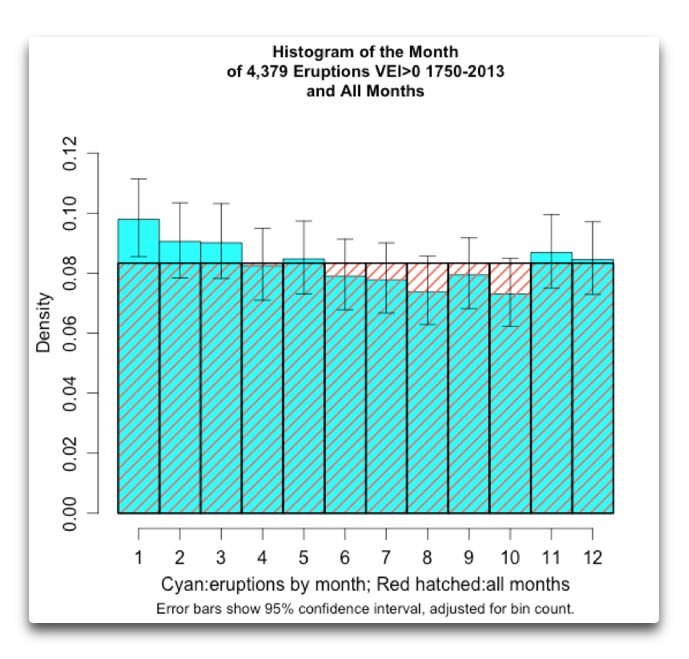 If 1 month has elapsed since the last eruption there is little chance of an eruption next month. And just the opposite [if] 11 months have elapsed since the last eruption. For those with a mathematical bent, it is simple to show that the interval between random events follows a negative exponential probability distribution. This distribution has most of its probability near zero (meaning most inter-event times will be short) but has a long tail (meaning a few intervals will be very long indeed). Thus in a completely random process the sequence of events appear clustered. Does the adage “good luck comes in threes” ring a bell? Sorry to take Bill’s Clinton’s famous “quote” out of context. Unfortunately this paper is paywalled but it is worth a read. “Explosive volcanic eruptions triggered by cosmic rays: Volcano as a bubble chamber” Toshikazu Ebisuzaki et all published in Gondwana Research 2010. It explains how the increase in cosmic rays during periods of low solar magnetic strength weaken some forms of volcanic calderas. The problem is the timing of subsequent eruptions from the weakening of volcanic calderas. The lags between the reduction in magnetic strength of the sun and a subsequent volcanic eruption can be anything – depending on the resilience of the caldera in the first place and the time it takes to weaken it sufficiently given the active agent (Muons) are still relatively rare even in periods of very low solar magnetic strength. So naturally there won’t be any real correlation between eruptions and sunspot activity except perhaps during periods of prolonged solar minimums such as the one that seems to have recently commenced. Recent records are useless. It is necessary to look at the at least the last thousand years of major volcanic activity to see the relationship with solar grand minimums and, unfortunately, there aren’t good records except what can be gleaned from ice cores. Or is this just a single data point, and not proving anything? While the theroy of unknone delay is fine, it sure is hard to prove. I knd of think that this may also be the issue with SST and temperature. Making a cooreleation very difficult. There’s a particular volcanic rock type that’s more susceptible to cosmic rays than others? Or it’s a caldera/cone geometric consideration? Sounds implausible to me regardless of the volcanic age. Two problems, we do not know what type of eruption but since the most common occur above subduction zones I will assume that type of eruption. Subduction events start fairly deep, where the temperature is high enough, so how sunspots inflence such an eruption I do not know. Secondly the graphs of event occurence is tied to actually knowing that an event happened. 200 years ago the eruption would have to be world changing or close to civilisation to be noticed. Today even the smallest event will be noted. So I think that data is based on wild assumptions. Change in solar magnetic field => distortion of Earth’s magnetic field => core dynamics change => affects mantle and even crust. 200 years ago the eruption would have to be world changing or close to civilisation to be noticed. The earth’s small magnetic field is created by giant mechanisms in the earth’s core. I don’t see how an externally forced change to the small magnetic field (the effect) could have any affect on the giant mechanisms in the earth’s core (the cause). It really dosen’t pass the sniff test. It’s really not. The earth’s magnetic field is created by the movement of a conductor (the earth) through an electrical field (the solar wind). There is no basis to assume that any unnoticed volcanoes would have substantially altered Willis’ results. I have been working as professional in this field for over a decade and I haven’t heard of this at all. But then nothing surprises me these days. Given the small number of samples a simple recursive Bayesian approach – and watch how the ‘prior’ evolves at each recursive step – might be interesting. Where is the maunder ? In our research, we compare the 148 volcanic eruptions with index VEI4, the major 37 historical volcanic eruptions equal to or greater than index VEI5, recorded from 1610 to 2012 , with its sunspots number. Staring, as the threshold value, a monthly sunspot number of 46 (recorded during the great eruption of Krakatoa VEI6 historical index, August 1883), we note some possible relationships and conduct a statistical test. • Of the historical 31 large volcanic eruptions with index VEI5+, recorded between 1610 and 1955, 29 of these were recorded when the SSN<46. The remaining 2 eruptions were not recorded when the SSN<46, but rather during solar maxima of the solar cycle of the year 1739 and in the solar cycle No. 14 (Shikotsu eruption of 1739 and Ksudach 1907) (chart 1). • Of the historical 8 large volcanic eruptions with index VEI6+, recorded from 1610 to the present, 7 of these were recorded with SSN<46 and more specifically, within the three large solar minima known : Maunder (1645-1710), Dalton (1790-1830) and during the solar minimums occurred between 1880 and 1920. As the only exception, we note the eruption of Pinatubo of June 1991, recorded in the solar maximum of cycle 22 (chart 2). • Of the historical 6 major volcanic eruptions with index VEI5+, recorded after 1955, 5 of these were not recorded during periods of low solar activity, but rather during solar maxima, of the cycles 19,21 and 22. 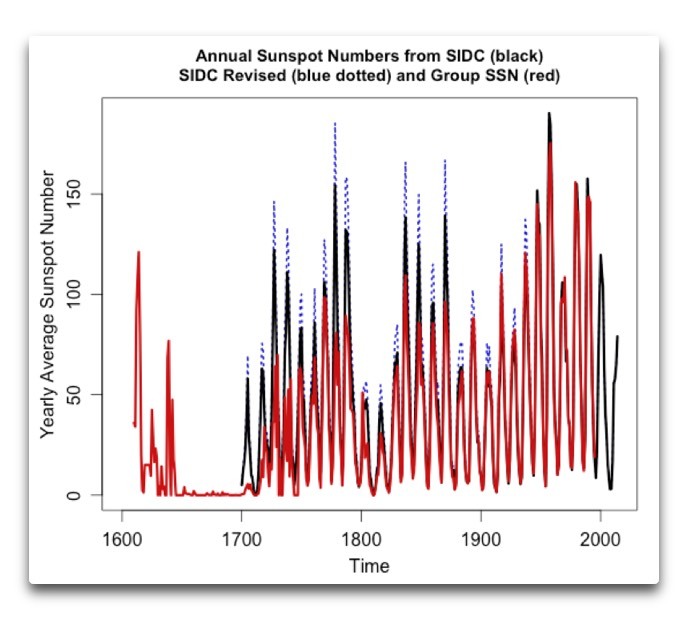 (*) Relative sunspots number Data : Group SSN yearly from 1610 to 1699; SSN yearly “SIDC” from 1700 to 1748; SSN monthly “SIDC” from 1749 to present. There are three problems with this. First, the yearly “Group SSN” includes years with only one single day’s worth of observations … very sketchy. The group SSNs are available here. I’m sorry, but estimating a yearly average from a single day’s observations don’t impress me much. Second, as Leif Svalgaard has explained here on WUWT, there is a problem with the SIDC numbers. They are in the process of being revised, with all numbers prior to 1947 being increased by 20%. Finally, you need to do a proper analysis with error estimates to determine whether your results are simply from chance, particularly when the data size is small. Iceland volcano became active in the middle of 2013. It can be seen that the magnetic solar activity was high. 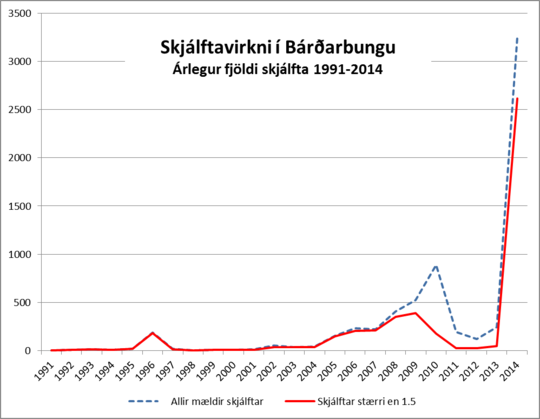 Here is a chart showing the annual number of shocks in Bárðarbunga the start of digital seismic survey, in 1991, the blue dashed line shows the number of all measured tremor, when the red line shows the number of seismic events greater than 1.5. Earth’s mass spinning in a period high solar magnetic flux, relatively stable geological conditions. A large magnet stabilizing the precession of a smaller magnet. Earth’s mass spinning on axis during a weakened solar magnetic flux, destabilized, axis shift, hunting poles, friction, pressure….time….changing planetary alignments….nutation. One wouldn’t expect to see immediate release of seismic or volcanic energy, reacting to short-term low sunspot activity. Coefficient of friction would affect every Earth system from the upper atmosphere to planet’s core. The moment in the frame of reference continuously altered. Oscillation must correlate to increased friction, increased seismic and volcanic activity, subject to the current state of stability at various points within Earth’s dimensions. Random events with notable increased frequency. It would be interesting to view this data on a sinusoidal plot overlay of solar activity. And all of the above quakes are surpassed by Japans Mega quake (M9) March 11, 2011. Number of days with a geomagnetic storm per year. Is approaching long minimum ? This was meant for Michele at 4:47 am. I think are important may be strong jumps in solar activity, which can activate the magma. For those worried increases in earthquakes, note the distribution. We are just in a uptick in the clustering nature of seismic activity. Quite frankly I think it correlates to the distance from the super massive black hole at the center of the Milky Way. As the black hole spins, it throws out gravity waves that ripple through galaxy causing all kinds of mischief. Aside from the eruptions, I think it would make a good movie or TV mini-series. Statistical significance is a Procrustean bed. The patterns are compelling. Why not keep an open mind rather than dismiss the possibility of an actual relationship on the basis of an arbitrary measure of statistical significance? Without a proposed mechanism, I wouldn’t imagine anything more than random correlation between sunspots and volcanic eruptions, even if the data sets were more significant. Such a mechanism made all the difference between Continental Drift and Plate Tectonics. The idea that volcanoes are somehow caused by solar activity is too far-fetched for serious consideration. No geologist would pay the slightest attention to such a claim, except to chuckle. Earth is just at 1 AU distance from the sun, while Jupiter is 5AU and Saturn at 10AU. If (and that is a huge if) changes in gravitational, tidal or electromagnetic linkage forces due to the elliptical orbits of the two giant planets of the solar system, cause changes on the sun then the Earth may ( or may not) be affected too by the same forces. Theoretically the Earth is absolutely affected, there is no doubt of it whatsoever, but it is assumed as far as we understand it that those forces on ‘one off’ bases are insignificant, however we do not know what the regular jolt effect (year after year for millions of years) may be. If (and that is a huge if) changes in gravitational, tidal or electromagnetic linkage forces due to the elliptical orbits of the two giant planets of the solar system, cause changes on the sun then the Earth may ( or may not) be affected too by the same forces. If, as the solar scientists maintain, it takes 100,000 years for a “particle” of newly fused energy to move/bounce/translate/rotate and jostle from the fusion zone in the sun’s interior to the radiant zone on the sun’s exterior surface, then very real periodic “jolts” of 80-60-88-600 or 666 years each would get smoothed into a uniform radiant level. There is just too many years of constantly changing ionized gasses randomly getting moved about to be able to maintain a short cycle from birth (any single fusion event controlled or influenced even a little bit by external gravity changes) to radiant released to the earth’s surface. Its just too small a frequency change input, and too small a change in that signal itself, for the final heat signature to be measured 100,001 years later. Or was that 980,000 years later? 102,015.13 years later? RACookPE1978 thanks for your comment. What solar scientist say (as you indirectly acknowledge) is absolute nonsense. Sun (as even my old grandma knew) has 11 year cycle, it also has 22 year cycle too, not to mention ‘sun today was same as 100 years ago’. Here is yet another illustration of data for events used by solar science showing direct correlation to those on the Earth, this time including a climate index. How are they doing at prediction? The science pretty much settled? Like climate science, pretty much have it figured out as to when and where the next event will be? I would think that establishing of no go areas in science is just as undesirable and unacceptable as it is in some of world’s urban conurbations. Predicting volcanoes? Seismic jolts often signal some eruptions. Can’t say about all. Generally you get eruptions where you have volcanoes, so prediction is not really a critical matter. Just don’t build on a volcano, like they do in Hawaii. Its got nothing to do with climate science or climate scientists, you see. There are folks out there who EXPECT scientists to make predictions. You don’t specify what statistical test you are running. Your Fig. 7 suggests to me that there might be some truth to the monthly eruption probability. The question is, what population is affected, and why aren’t you running a power analysis. Sorry I don’t know the appropriate test. I really should get out more. But you don’t appear to be running the appropriate test either. Thanks, that makes it a positive correlation as I have found and mentioned above, he also suggest using 20 year bins, I used 22 year integral. Time series analysis of the volcanogenic acidities in a deep ice core from Greenland, covering the years 553-1972, reveals several very long periods ranging from ~80 to ~350 years and are similar to the very slow solar cycles previously detected in auroral and carbon 14 records. Solar flares are believed to cause changes in atmospheric circulation patterns that abruptly alter the earth’s spin. The resulting jolt probably triggers small earthquakes which may temporarily relieve some of the stress in volcanic magma chambers, thereby weakening, postponing, or even aborting imminent large eruptions. In addition, decreased atmospheric precipitation around the years of solar maximum may cause a relative deficit of phreatomagmatic eruptions at those times. Geologic is all about cause and effect. We try to find this connection by correlation of events, but as is often noted, correlation does not prove cause– it simply makes us look more closely at critical relationships. Willis is exceptionally good at this. Well, some scientists will look for a pattern in a keg of nails and call it science. They fail to understand that recognizing a pattern is but a tentative start and can lead nowhere. In the case of volcanoes, there averages 50-60 eruptions/ year. If sunspots cause eruptions, why are there eruptions when there are no sunspots? The obvious answer is that there is another cause. But they cling to their beloved sunspots. The human mind is not obligated to use mathematical rigor in its curiosity and its quest for identification of patterns in the external world. Human imagination and mental adaptability depend on “fuzzy logic” – best described as the application of hasty generalizations based on insufficient data – to infer that a pattern exists. When the mind perceives a rare event to recur, it immediately starts asking itself how long it has been since the last such event, and positing that the event will recur after a similar interval. This has been drilled into us since hominids first recognized that the sun will rise again after 1 day, and that there are seasons every year. For example, the Yellowstone Caldera has given us evidence of several mega-eruptions at apparent intervals of 600,000 to 800,000 years (2.1 million, 1.3 million, and 640,000 years ago). The temptation is very strong to apply this apparent periodicity as a template and infer that ‘we are just about due’. With the state of our current knowledge of vulcanism, however, there is absolutely no reason to expect that the next eruption (if there is one) will occur with any different likelihood on either March 1st 2015 or March 1st 2,000,015. Not that this is necessarily a bad thing. If we recognize patterns in events as soon as possible, that helps empower us to respond proactively. Neglecting a possible pattern because the data for it is not absolutely persuasive could leave us vulnerable to an avoidable catastrophe. Unfortunately, it is not always easy for the human mind to abandon an apparent ‘pattern’ once it has been adopted as a paradigm, regardless of how flawed it may be. Sometimes a Truth is accepted only because it outlives the Error. A god dies only when the last of those who worship him die. Astrology can be seen as a failed methodological search for patterns. I suspect that astrology is in fact a real effect that was mis-interpreted. The real effect involved depends on the season on which one’s birthday occurs. For an Aquarian like me, in the northern hemisphere, I was very much more likely to be given birthday presents like books, or models, or board games, and thus an introverted, insider personality results. My brother, in contract, being a Gemini was more likely to get footballs, bicyles, and outdoor pursuits, and hence is more sporty and less booky than I. If this theory is true, then the patterns should be inverted in the Southern hemisphere, though less pronounced due to the lack of [population] in the colder south. For example, the Yellowstone Caldera has given us evidence of several mega-eruptions at apparent intervals of 600,000 to 800,000 years (2.1 million, 1.3 million, and 640,000 years ago). Old Faithful comes to mind. The temptation is very strong to apply this apparent periodicity as a template and infer that ‘we are just about due’. With the state of our current knowledge of vulcanism, however, there is absolutely no reason to expect that the next eruption (if there is one) will occur with any different likelihood on either March 1st 2015 or March 1st 2,000,015. But, like CAGW fears, you cannot use the precautionary principle to “avoid” a possible future problem by deliberately causing infinitely greater absolute damage to billions while attempting to stop something that might not happen, will be beneficial if it continues, and has benefits from its very presence (greater CO2 absolutely causing greater plant growth for example), AND allowing more people to live more fruitful lives, cannot be denied. Willis, you’ve just shown that ‘though thou be scrappy, thou art kind. As noted previously, there are roughly 100 astronomical observations/analysis results and paradoxes and unexplained earth phenomenon that support the assertion that the sun and other stars are fundamentally different than what is assumed. How the sun is different than assumed explains why solar changes affect volcanic eruptions and the geomagnetic field. It is an observational fact that the geomagnetic field intensity started to decline 10 times faster in the mid 1990s. There must be a physical reason why the geomagnetic field suddenly started to decline 10 times faster. It is an observational fact that past abrupt climate changes correlate with geomagnetic field changes and solar magnetic cycle changes. Every physical observed change must have a physical cause. As these papers note nuclear decay rates on the earth changes seasonally, for some unexplained reason. The experimenters have measured the decay change in both hemispheres and have confirmed the seasonally change in decay rate is not due to temperature changes or pressure changes. The sun is causing the change in decay rate. An observation to support that assertion is the sudden change in nuclear decay rate when there is a solar flare. An physical explanation as to how solar changes could affect nuclear decay rates and the geomagnetic field could be the reason why there is a delay in the onset of global cooling due to the interruption to the solar magnetic cycle. The researchers are appealing to changes in neutrino flux as the cause of the change in the nuclear decay rate, if I understand the mechanisms and what is currently happening to the sun, that belief is not correct. Solar magnetic cycle changes cause the planet to warm or cool by a complex set of mechanisms that modulate the amount of planetary cloud cover and cloud properties. All of the cloud modulation mechanisms are charged based (Changes that affect the amount of ions created in the atmosphere, mechanisms that affect the movement of ions in the atmosphere, and an unexpected mechanism that changes the total charge in the vicinity of the earth will affect cloud formation. Changes in total charge would affect nuclear decay rates, would affect the geomagnetic field, and would affect volcanic activity, there would be a time delay if there was a charge unbalance as current moves to or from the core to attempt to equalize the planet’s net charge. There are multiple observations that support the assertion that there is a significant unexplained charge unbalance and changes in charge unbalance). The amount of ions produced by high speed cosmic particles (solar magnetic cycle changes cause changes to the solar heliosphere – the solar heliosphere extends past the orbit of Pluto and contains magnetic flux which blocks and deflects high speed cosmic particles, mostly protons – which blocks high speed cosmic particles, the high speed cosmic particles create ions in the atmosphere) and charge movement in the ionosphere (solar wind bursts create a space charge differential in the ionosphere which changes the amount and properties of clouds in high latitude regions of the planet and in the tropical region. We provide the results from a spectral analysis of nuclear decay data displaying annually varying periodic fluctuations. Data obtained during the solar flare of 2006 December 13 exhibited a significant dip in the counting rate of 54 Mn nearly coincident in time with a solar flare, thus supporting the suggestion of a connection between nuclear decay rates and solar radiation . Power-spectrum analyses of the decay rates of certain nuclides reveal (at very high confidence levels) an annual oscillation and periodicities that may be attributed to solar rotation and to solar r-mode oscillations. A comparison of spectrograms (time-frequency displays) formed from decay data and from solar neutrino data reveals a common periodicity with frequency 12.5 year, which is indicative of the solar radiative zone. We propose that the neutrino flux is modulated by the solar magnetic field (via Resonant Spin Flavor Precession) in that region, and we estimate the force and the torque that could be exerted on a nuclide by the solar neutrino flux. Willis — You say “I keep reading how sunspots are supposed to affect volcanoes.” Is there anyone other than Stothers 1989 promoting this somewhat unlikely idea? Willis the raw data shows otherwise . Major volcanic eruptions and major earthquakes are associated around sunspot minimum. I will send the data. Here is the data. Willis if you choose not to believe it fine. I do. This is not a question of believing but showing, in numbers that measure the activity rather than counting how many happened during a ‘minimum’. No need to get annoyed, either. The data speaks for it, or doesn’t. We’ve had nineteen of them since 1750. It turns out that no less than thirteen out of the nineteen occurred when the monthly sunspot number was quite low, below 40 sunspots … sounds impressive, right? FROM WILLIS. END OF STORY.ITIS IMPRESSIVE. Off topic, but interesting none the less. A person using data from the Big Bear Solar Observatory created a PowerPoint presentation. It analyses variation in the Earth’s albedo based on the measurement of brightness of dark areas of the moon. Those areas would be illuminated by earthshine and thus would be a measure of Earth’s albedo. The analysis reduces numbers to watts per square meters and concludes the normal variability of albedo is greater than appreciated. Furthermore, natural variability in albedo is more significant in terms of watts per square meter than the hypothesized increase due to CO2 changes. There are some minor problems with the method. Moon has no magnetic field to protect it from direct impact of solar wind. Solar wind (intensity is continuously variable). SW particles electrically charge the lunar dust; result ‘moon dust wind’ altering moons albedo. Does Moon has active volcanoes or a mantle or oceans for that matter. Is same as like trying a figure out how a cadaver will sweat or tan in the sun, so to speak. When they were doing the investigation, I sent an email suggesting the possibility of the big Peruvian quake having given the mine a shake. No one responded and they apparently cited safety violations as the cause. I also recall distant significant earthquakes after the Bam one in Iran that took 50,000 lives. Anecdotal, I know but maybe this kind of thing could cause clustering. Has anyone taken underwater eruptions into account? There may well be more volcanoes under the sea than on top of it. The detection rate of eathquakes appears to be inversely related to the number of unsettled square miles of the Earth’s surface. I can’t find any justification for prefiltering the data by earthquake intensity given that most earthquakes are barely perceptible but no less important than the “big ones”. There are also slow earthquakes that last for months or years. It would be interesting to calculate the energy dissipated by all earthquakes on a per-year basis or even a per-decade basis and which includes every detectable rumble. Regardless of what is discovered it is of no significance because there is nothing in the science that matters in the rush to create climate change policy. It is purely political and any science, real or imagined, is distorted to suit the agenda. future project for Mr. Eschenbach perhaps? Willis will keep trying to prove solar/climatic connections just are not so even though he has yet to do so. And how do you Salvatore propose to prove solar/climatic connections are so strong and important as you keep claiming. Any time there is something about some probable considerable impact or effect in climate change considered you keep trying to connect it to the solar effect. As we are in the arguing of a particular such as, the volcanic activity, how do you propose, that in the case of the sun effecting the volcanic activity, does the sun has a significant climatic impact, as for it to have some considerable force for climate change? The correlation of the volcanoes with climate change is not as strong as to be considered in its own, only in face value, as a significant climatic forcing for climate change, unless at least is put in a context of a hypothesis as in the case of the Maya Tolstoy’s paper. She went to trouble of having a new hypothesis to link volcanoes to climate change and in the way show the tidal and M. cycles forcing/climatic connections as a very important issue. Are you actually piggybacking your solar/climatic connections on her work by some how claiming that she is wrong about tidal and M.cycles forcing while you are right about your solar/climatic connections? If not then you have to come up with another hypothesis how the volcanoes and volcanic activity would cause climate change or be a significant forcing for climate change, otherwise regardless of what effect there may be from the sun to volcanoes, you still in dry so to speak, as per the assumed solar/climatic connections. whatever that connection or these assumed connections been, not significant or important enough in climatology. Likewise, what would happen to volcanic activity if you turned off the sun ? Michele thanks for that paper which supports about the role of the magnetic field/solar —geological connections. There is also good evidence of a climate connection. Piers Corbyns predictions for June 2012 randomly found on Google. Coincides roughly with 5-15 eruptions. Figure 5 is actually 5kg of finest organic King Edwards potatoes at Tescos for £4.99 – I swiped it at the self checkout to be sure. I think we should be looking at Earth rotation with respect to Volcanoes and Earthquakes as (1) ONE, of the parameters that might affect them. If we look at length of day changes as in the image below, we might see the solar cycle decline of recent years. on page 4 and you might see how sparse the addition of leap seconds have been since 1997. About 90% of the total number of large volcanic eruptions are accounted for by eruptions on the coasts of the Pacific (about 80%) and the islands of the Sumatra–Java volcanic belt (about 10%). Most large volcanic eruptions occurred in the equatorial region, followed by high latitudes in the Northern Hemisphere. There were significantly more in the Northern Hemisphere than in the Southern Hemisphere. In contrast, very large volcanic eruptions mainly occurred at high latitudes in the Northern Hemisphere, followed by low latitudes in the Northern Hemisphere and the equatorial region. Errr……that’s where a lot of the larger volcanoes are, and the people to see them. Southern Hemisphere eruptions generally lacked a viewing public. (2) Large volcanic eruptions were mainly concentrated at elevations of 1000–1500 m and 1000–2000 m.
Hmmn….. that’s how big volcanoes need to get before they can produce a large eruption. (3) The greatest numbers of large volcanic eruptions occurred in January and April, with each month accounting for more than 12% of the total, and the number in the summer half-year (from April to September) was slightly higher than that in the winter half-year ￼(October to the following March). In contrast, the number of very large volcanic eruptions was clearly higher in the winter half-year than in the summer half-year. 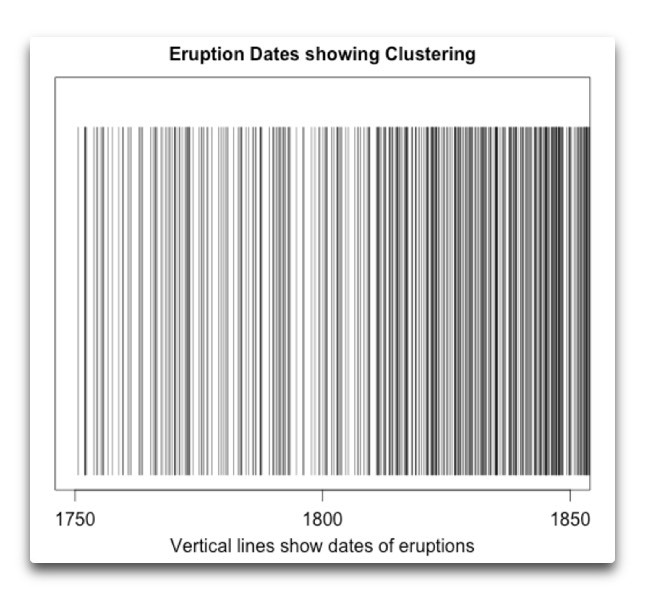 (4) The year 1870 was the shift point of the cycle change for large volcanic eruptions since 1750. A cycle of 35–50 years was dominant before 1870, but a cycle of 15–25 years prevailed after that. Large volcanic eruptions mainly occurred in 1750–1760, 1776–1795, 1760–1830, 1871–1890, 1911–1920 and 1911–1995, with fewer in other periods. You seem to be doing what the drug companies do to assess the safety of their drugs, is have a limited sized sample and say see no significant impact of our drug! Now intuitively you would want to check with the Devries cycle and check and see if there is a pattern associated with volcanic activity in solar minimum periods where the earth is contracting and putting ever so slightly more pressure on the core. I think you will find something there. 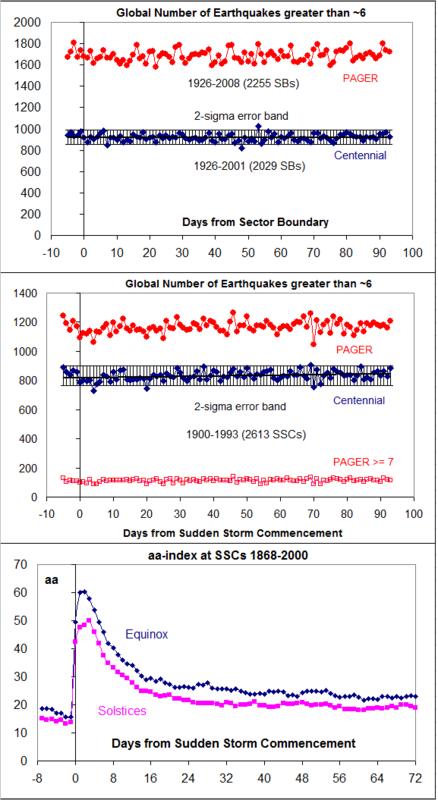 For earthquakes check for large earthquakes after a solar minimum when the sun awakens and you get large coronal outbursts like the ones that happened in 2011 (the japan march 11 and new zealand feb 22 quakes followed large CME’s events by a 1- 2 weeks). I think there are linkages between both earthquakes and volcanos and solar influences. This is why I ask people to QUOTE THE EXACT WORDS THAT YOU DISAGREE WITH. Roger, I don’t know if you are replying to me or to someone else. And if you are replying to me, I have no idea what it is that you are objecting to. As to your suggestions as to what I should “check”, I’m sorry, but I check whatever I think is important. Since you obviously think your proposed relationships are important, intuitively YOU would want to check those things. And since you haven’t done so … why should I bother to do your work for you? 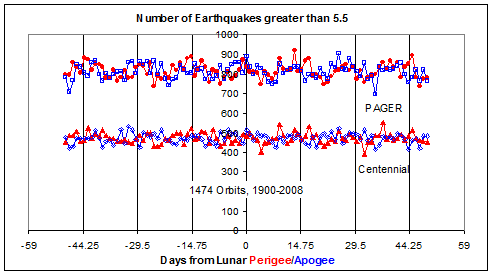 PS—You say I should see if there is “a pattern associated with volcanic activity in solar minimum periods” … what on earth do you think that Figures 1-4 in the head post are doing?